"Kids, it is time to go to the warehouse store!" she yelled. Her arm muscles flexed and her patience went into a meditative state. Everyone stated they went to the bathroom, so they left. The drive to the warehouse store was the standard faire. Charlie was in the back seat breathing on his brother. "Make him stop breathing Mommmmm!" whined Alpha. Bravo was quietly sitting in the middle row picking his nose, and inspecting the findings. The mother parked the car, rounded up all three boys and headed towards the store. Even though she was outnumbered 3 to 1, she persevered, list in hand, with visions of finishing the trip in under an hour. "I got the cart," stated Alpha. Bravo quickly retorted, "Noooo, he picked it out last time. I have one!" All the carts looked the same, smelled the same and had the same wobbly wheel. Yet, both boys stood smiling with their chosen cart in hand as though they were holding a trophy. About five feet into the store something happens to the cart. It begins to attract the hands of anyone under the age of twelve. "Let go of the cart, please. I can't push it if you are both holding onto it," requested mother. "Would you like to try the spinach and broccoli sample?" asked the lady in the hair net. Alpha, Bravo and Charlie all answered, "Yes!" They ate the sample, without a gag or a scowl. Mother was excited and purchased four bags. Little did she know they were magic samples. Samples only to be consumed by children at the warehouse store and not at home. She would be eating spinach and broccoli for months. The hands migrated to the cart again, causing a collision near the batteries. "Let go of the cart please," she stated. Five pounds of baking soda, ten pounds of coffee, and twelve bottles of dish soap went into the cart. The cart ran into the dog food. 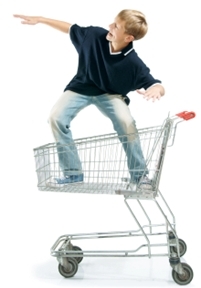 "Let go of the cart, NOW," mother said sternly. In the cereal aisle, she measured the boxes of cereal carefully. 6 inches by 18 inches for Wheat O's, two will fit in the cupboard. Just as she began to pull Alpha from the Fruity Nitty's pallet where he was hiding, a faint voice starts talking to her. It was Charlie buried under 100 rolls of toilet paper at the bottom of the cart. "Oh, there you are," she said. "I have to go to the bathroom," said the faint voice. "Didn't you go before we left? Can't you wait?" she hoped. "No," Charlie whispers. A full shopping cart guarantees a bathroom stop. "Mom, can we have Sugary Bars?" "Mom, can we buy the twenty pound tub of licorice?" "Mom, can we get the 100 tennis balls?" "No, no, and no," answers Mom. "What about the 100 book series from Jimmy Letterhead? It's the complete set?" asked Alpha. "NO," she answers. However, the two hundred and fifty popsicles might last all summer, so those go in the cart. Just past the skin creams, the cart won't move. "Let......go.......of.....the.....cart," grimaces mom. Just past the tires, the cart won't move. "Boys, get off the cart, let go of the cart, do not touch the cart!" mom says firmly. They progress through the checkout and the items are neatly organized by the clerk who went to a class on how to fit everything back in the cart with room to spare. "Would you come pack up my pantry?" asked mother. "That will be $%$& dollars," said the cashier. Secretly the cashier knows the store won't let you out until you have spent at least $100. The sample people make sure of it. She takes a head count and begins the re-entry process into the parking lot. It is 2pm on a Saturday afternoon and the parking lot looks like a pinball machine. "Ok everyone, hold onto the cart so we can stay together," she said. All three looked at her puzzled. "No, we don't want to," they all said. She looked back. They weren't in the warehouse store anymore. The cart had lost its magnetism.